Today’s episode comes to you from the road. As eCommerce entrepreneurs, flexibility is one of the biggest perks of the job. But how easy is it to pack up the family into an RV and head south while trying to stay on top of your business? Hop into the passenger seat as we dive into what it takes to hit the road, spend time with family and turn an RV into a mobile office. Today, I share my personal experience on the road, away from Montana, while trying to get meaningful work done, as well as the biggest lessons I’ve learned from this incredible experience. Andrew: When I sat down in January to plan out my year, one of the first things to make the list was not to be in Montana on March 15th. It’s a great state but the springs can be a little cold and miserable, and so our family decided to get out of town and spend a month in Morro Bay, California. Today on the eCommerceFuel podcast, I want to take you along on that road trip for a number of reasons. I want to take you down to our eCommerceFuel meet-up that we had in southern California, take you inside the recently Shopify Unite conference that I went to and give you some of the takeaways from there and some of the please I met, but ultimately I want to answer the question: can you get real meaningful work done on your business from the road, even if you have a family in tow? Let’s find out. 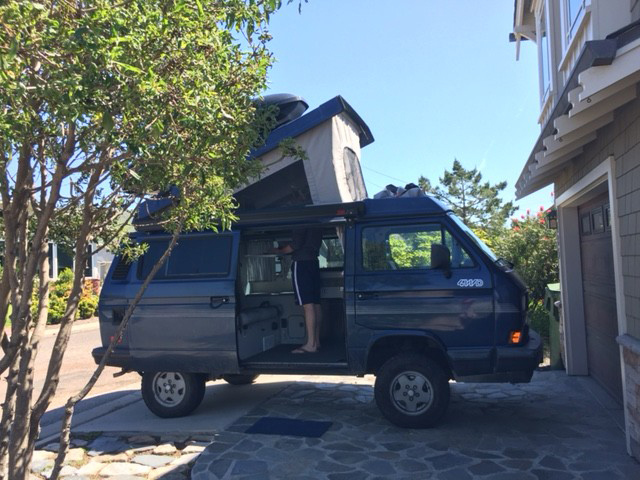 Andrew: We decided to drive down and the vehicle for the trip is my 1990 VW van. You may have heard me mention it before. It’s a little house on wheels I bought probably for like a quarter-life crisis when we had our second daughter and I was convinced that we’d never leave home again. But a vehicle I’ve always loved. It’s a little van that seats four people. It sleeps four people with a couple of beds. It’s got a fridge, stove, sink, a couple tables, a heater to stay warm at night, and a sliding door that sounds like a guillotine from the French Revolution. The drive from Bozeman to Morro Bay was almost 1,300 miles, which is really equivalent to 10,000 miles if you’re traveling with kids, as anyone with kids will know. You’ve got bathroom breaks and other miscellaneous stop required every 20 miles. And in a van, you try to stick to the side roads because the interstate just isn’t that fun. The van’s already noisy. You usually max out at about 65 miles per hour or 50 miles per hour if you’re going up hills. So on the interstate when people are screaming by you, it’s not that fun. So we slated five days to travel down. We stayed with friends the first night and camped in Utah, Nevada, and California the next three nights. And I think my first lesson takeaway from being on the road is that you’ve got to have a core team in place for the times that you aren’t going to be able to work operationally. I can’t imagine trying to get away. We were camping, which is a little bit tougher, no cell service, but even just in transit, driving and airports, it’s really hard to meaningfully run the operations of your business. So lesson number one, if you want to do this kind of thing, you’ve got to have a core team in place, which I’ve been blessed to be able to have some great people come on board that I can trust. Getting close to California, we of course had to go through Nevada which beautiful but incredibly lonely place. We went hundreds of miles sometimes without seeing really any other meaningful signs of civilization. Fortunately, we had DJ Claire to get us through some of those lonely stretches of road. Andrew: What do you think about the desert out here? Claire: I love the desert. Andrew: Should we camp out here like gypsies forever? Or should we go to the beach? Claire: Go see the beach. Claire: And camp. Go to the beach. Andrew: Finally, we arrived in Morro Bay, California, to our home away from home, a little, small, 1,000 foot square foot, two-bed, two-bath home about five minutes’ walk from the beach. Really a perfect home for the road. The second critical part for me of being able to get real work done from the road is having a temporary base. Maybe there are some people in the world who can be on the road and get a ton of work done on a train and then jump on over to a hotel room and packing up and moving all the time but that’s impossible for me. What’s worked really well for me in the past and the way we were set up this trip is travel, camp, have fun for three or four days, and then have a temporary — have a permanent home base that you can work from on the road. And that’s the only way I can get things — get any meaningful amount of work done. The weekend after arriving in California, there was a meet-up of eCommerceFuel community members just south of LA and was excited to go and meet up with people. So got up early, drove down, which by the way I have no idea how there’s traffic in LA at 10 a.m. on a Sunday morning. It’s mind boggling. I drove down and arrived just in time for what was a great event with about 25 people from the forum there. It was fantastic. It’s really fun to meet members in person. So many people there. Some of top members never met face to face. But here’s a couple that I was able to chat with. Tal: My name is Tal Moore. Andrew: And it’s rumored you are the man responsible for this fantastic meet-up here in California. Is that true? Tal: Yeah, yeah, it is. Yeah, it’s been an awesome experience and always a good turnout with really, really smart people and really great conversations. So really glad to be a part of it. Andrew: Yeah. I can’t tell you how much I appreciate it. Thanks for doing it. How long have you been in eCommerce for? Tal: I’m a relative dinosaur in this space. I started in 2000, so 16 years. Andrew: And you’ve got a bunch of different things going on but what are one or two of your key things or key properties? Tal: My very first one was gumballs.com but shortly after I started gumballs.com, I started epopcorn.com and that’s probably my main focus these days. 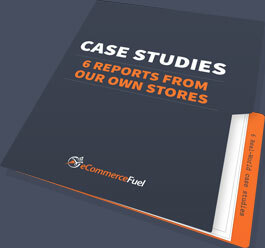 Andrew: Any memorable story or event that really stands out over the last 15 years in eCommerce? Tal: We started with dropship, similar to you, and then we finally made the decision, big decision, to invest in our own inventory, and I imported from China for the very first time and I was just scared as all hell and I put everything I had in the inventory. We were one of the first to sell made in China imported popcorn machines and carts. We experimented with it in the summer and then we just did this ramp-up to Christmas. The demand was just so incredible that I was bringing in popcorn machines by the container load, and I had a 3,300 square foot warehouse and I remember mid-December or early December one year our warehouse is literally jam packed, and we blew through several container loads of popcorn machines. It was literally hit our docks, go up to our warehouse, turn around, slap UPS stickers, and then ship them right out. We moved so many machines. Patrick: My name’s Patrick Shanahan and I’m the marketing guy over at a new shopping cart called Art Storefronts. We’re basically Shopify, Bigcommerce, Magento specifically for artists, photographers, art galleries, and individuals, businesses that own print studios. Andrew: Awesome. How long have you been in eCommerce for? Patrick: Probably going on 8, 9, 10 years on. Andrew: And in all that time, is there one moment that stands out as an incredibly memorable moment for you for any reason? Patrick: Have you heard of geo-fencing? It’s a technique on Facebook wherein you’re able to pack an area that’s just like a mile wide. Maybe before you were able to advertise in California or San Clemente and get that granular. Now with Facebook, it’s got this new technique that you can get so granular, you can go all the way down to a mile circumference. Just this last week, another company that I consult with had a trade show, a pet trade show. We ran a Facebook ads campaign with the geo-fencing where we drew a circle, a mile circle, around the trade show and ran some awareness ads and had no less than 25, 30 people come by the booth and go, “How in the world did you get into my Facebook feed? How did you get into my Instagram feed? I don’t even understand it. I’ve never seen anything like it.” So there’s the power of technology. There’s the stuff that we love, right? Andrew: After the event, hopped back in the van and started heading back home to Morro Bay. And as I drove, I had a lot of time to think about how powerful in-person meet-ups are. They’re definitely something that we’ll emphasize and investing a lot more resources in in the future for eCommerceFuel. Arriving back home, it was finally time to get some work done. And I may be unique but one of the things that allows me to get things done at home in Montana is having a dedicated work space, my office. I can’t get things done if there’s other people around. And in a 1,000 square foot home with no desk and two very vocal young girls running around, this was an absolutely critical part of being productive on the road. The solution? I turned the VW van into a mobile office. It sounds kind of ghetto and I got some strange looks from neighbors, but it worked really well. Pop the top, raise the table to elbow height, put the laptop on the upper bed, and with a wireless mouse and keyboard, I had a full on standing desk. It’s actually where I’m recording this podcast from right now. But bottom line is this was probably the number one thing that allowed me to actually be productive on the road, especially with a family, having a space that’s carved out completely for work. Without doing it, there was no way I could have gotten any meaningful amount of work done. It’s huge if you’re going to be trying to make this work on the road. After a short stint back in Morro Bay, I headed up to San Francisco for Shopify’s United Conference, which was their first conference ever specifically for Shopify partners and developers. I wasn’t sure what to expect, of course, but was really looking forward to meeting a bunch of people there I’d never connected with. So I hopped on a short flight for the two-day event in San Francisco. Male: …You all for being here today. 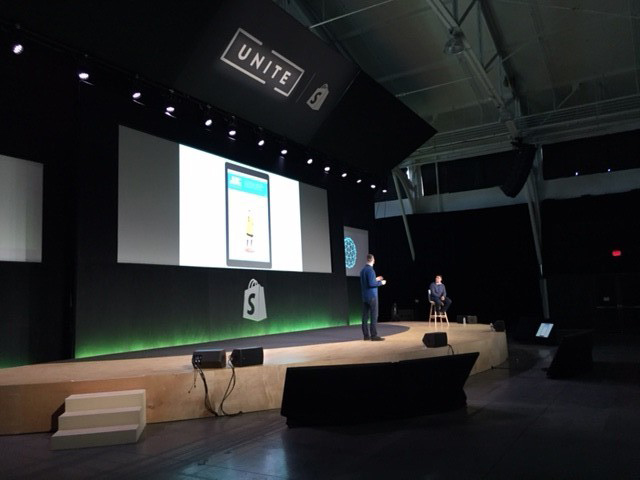 Welcome to Shopify Unite. But probably the most exciting part for me was just connecting with a bunch of people I never had the chance to before. Here at Shopify United with…sir, what’s your name? Andrew: Wait, wait. Hold on a sec. Are you the Ed Hallen from Klaviyo, the one and the same? Andrew: Awesome. You’ve got a killer product. We ran into each other just sitting at the keynote presentation and good to finally meet you in person, sir. Ed: Yeah, absolutely. We’re excited to be here and it’s just been way too long that we haven’t met. Steve: How’s it going, guys? Andrew: Good. How you doing, Steve? Steve: Pretty good, pretty good. Came out to meet you here, Andrew. I really have no other reason to be here. Hang out with Ed, you, Chad. Andrew: It’s pretty much like a tax deductible time to hang out and have a good time. Steve: Yeah. I don’t have to take care of the kids today. I’m just out here working really hard in case my wife’s listening to this. Andrew: And you’re staying in your car in the parking lot, right? That’s what you told me at the beginning. Steve: Yes. Hotels here are very expensive so I’m crashing in my car after this. I don’t have a van like Andrew does. Andrew: So the rumors of your frugality are not — they are true. Andrew: I’m sorry. We’re off the record now. I stopped recording. Andrew: Can you tell me your name please? Andrew: And Mark, what company are you with? Andrew: And what does Gauge Interactive do? Mark L.: We’re an eCommerce retail website design and development specialist. Andrew: And what are your thoughts on the event here after being here for over 30 minutes? Mark L.: Well, the coffee is good. It looks like it’s going to be a great event. It’s a nice small group, not too big, not too small. Looks like they’ve done it right. We’ve been able to talk with some really great people so far and it’s been positive. Andrew: You are officially on the Shopify team, right? Mark M.: Yeah, I’m on Shopify’s growth team and I specifically manage our content marketing team. Andrew: So you’re the man behind the impossible to beat Shopify blog, which pretty much just cranks out incredible content night and day, is that right? Mark M.: That’s right. Myself and our team of amazing content marketers, we’re the folks behind the blog and the articles and the podcasts that we have going out there on a weekly basis. Andrew: Yeah, you guys do an incredible shop. Any big changes or things to look forward to on the blog coming in 2016 and beyond? Mark M.: For sure. This year we want to get into some more content formats. We’ve already started with podcasting this year. We’ve got two podcasts, Shopify Masters which takes people behind the scenes of merchants business, and then our other is called TGIM, and it’s more of a show about entrepreneurship and helping people live the life they want to live by being able to create a business for themselves. Andrew: For me, the biggest mindset shift I took away from this conference was about virtual reality. Virtual reality is something that I haven’t, to be honest with you, given a ton a thought to. But Shopify had a booth with a retail VR environment, the headset, the little hand controls where you can use your hands in VR. I went in and, after two to three minutes of using it, was just blown away. I can actually see VR coming to the mainstream market in terms of eCommerce in the next five years. If you would have asked me before trying it myself, I would have said, hey, maybe 15, 20, 25 years down the road we’ll be shopping in VR. But I can honestly see it happening in the next five years. The demo had me in a retail environment standing at a booth. You could look around. It’s incredibly immersive. And you could just pick up things that were on the retail counter and look at them hats and shoes, and rotate them. It was incredible. Obviously, it’s a ways away but I see a day coming in the not-too-distant future where you’ll have a mobile version of your site, a desktop version of your site, and a VR version of your site. It was incredible. I’d love to do an episode on VR more in the future but for me, it was a huge shift in terms of thinking about what’s coming down the pipe in terms of innovation in the eCommerce world. 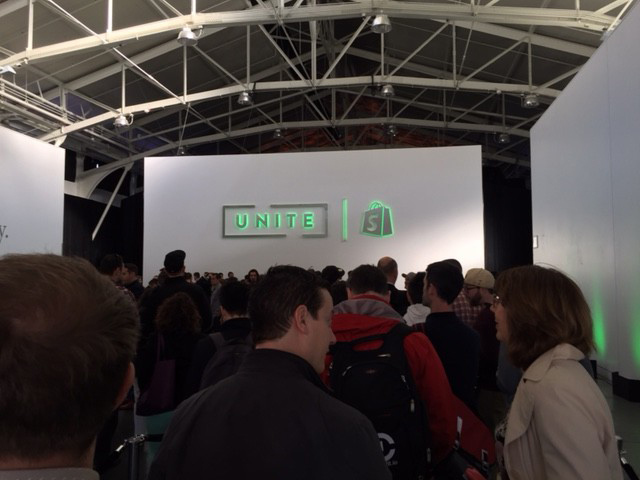 Overall, I was really impressed with Unite Conference. I’ve been a fan of Shopify and worked with them in the past but there was two things that stood out to me. First, the production quality of the event. It felt incredibly Apple-esque, like an Apple product announcement. So I was very impressed with just the competency and the execution of the event. I think that speaks to the team there. And secondly, Shopify, what they’re focusing on. their leadership, Tobi and Harley, focusing on the future of eCommerce, their developer partners. And really I got the sense that they were in this for the long haul. It gave me a lot of confidence in the team and where they’re going, which is cool. Heading back to Morro Bay again, I started to get some more work done after having a quick time to connect with the family after being gone, and there was a couple things that I was trying to make progress on the business stood out to me working from the road. The first one was thinking about how you can 80/20 your work on the road. And this is important, I think, when you’re at a home base when you’re at home in your office day to day but when you’re traveling on the road, especially if you’re trying to do this as more of a long-term lifestyle, that 80/20 is so huge because I’ve got…so many times, my girls would just run out to the van and want to play, or I’d go on walks with my family on the beach in the middle of the day, or Annie would need a lot of help because she’s living in a house that’s not hers with two little kids. The time that you have to really get meaningful work done shrinks, so it makes it all the more important to 80/20 things. I think I really was almost zealous about carving out four hours every morning of trying to get the most important work done. I think I missed replying to some people. I think there’s things that fell through the cracks but if you’re going to be on the road, especially with a family, getting almost just militant about that 80/20 rule in your work is important. Finally, the last thing I realized was being on the road with kids, there’s no way to get meaningful work done and make this work long term if you don’t have a spouse that is onboard with it. Not many women would spend a week living in a 50 square foot van with a couple of girls who are dealing with the challenges of being in a non-baby proof space with a toddler for a while. And definitely helped out Annie a lot, we’re a team, but it’s a different lifestyle. You’ve got to be really patient and onboard with this. So having a spouse that’s willing to do that is just enormous. Possible to travel long term and have it be meaningfully productive and impactful to your business, especially if you’ve got kids, probably easier to do if you’re single or married but with kids, can you pull it off? I think you can. But my key takeaways have been you’ve got a killer team in place that can handle operations, you’ve got to be able to set up a home base on the road, you’ve got to be able to carve out a protected work space in that home base, focus on your 80/20, and if you’ve got kids especially, having a spouse onboard is just huge. There’s a few weeks left here before we head back to Montana. Actually going to be dropping off the girls in Las Vegas to fly back home and picking up a college roommate for a little boys road trip as I travel back north. But I asked Claire, my oldest, her thoughts on eventually returning home. Claire, are you excited to go back to Montana, go back home? Claire: No. I like staying at California at the beach. Andrew: You don’t want to go back home at all? Claire: No. I like playing at California at the beach. Andrew: Would you rather live at home or live in the camper van? Claire: Live in the camper van because it’s fun and I like going on adventures. Andrew: Should we just sell our home and live in the camper van full time? Andrew: I like this idea. Sounded good to me. So I ran the living in the camper van thing full time by Annie. Annie, are you up for selling the house and traveling and living full time in the camper van? Annie: Maybe in 17 years. Andrew: What happens in 17 years? Annie: Then it’s just us and the girls are out of the house. I’d love to hear your stories and thoughts on on the road travel and work, making those mix well together. You can comment on this episode and share your thoughts as well as see photos from the trip and the portable van office at eCommerceFuel.com/roadtrip. And if you’re a store owner, I would love to have you check out our private vetted community for independent merchants. You can learn more about that and apply for membership at eCommerceFuel.com. Thanks so much for listening and looking forward to seeing you again next Friday. eCommerceFuel Forum: Do You Want a 4hww Muse or a Gull-Grown Business? Thanks Kira! Appreciate you listening! Great episode like always. I enjoyed how you involved your family in this one. Thanks buddy! Definitely been thinking of you guys up in Bozeman, and excited to return and get our ping pong back on. See you soon and thanks for tuning in! Sounds like a great family/work adventure. I loved the NPR sound reporting feel to the podcast with background noise and sound effects – my favorite was DJ Claire! I am curious did the change of venue inspire any creative or new ideas in your work that you think you might not have gotten if you stayed home? Thanks Dana! Yeah, once I heard Claire mixing a beat I couldn’t resist putting it into the episode. In terms of additional inspiration: Not sure if I can point to a specific “ah ha” moment or big idea, but changing the environment definitely helped get me energized and thinking through problems in a new way / fresher mindset. It also helped me feel more excited about some existing business plans and more eager to execute on them. So overall, definitely a positive thing in terms of making progress. Appreciate you listening and hope you have some good RV adventures planned for this Spring / Summer! Hi Andrew, really enjoyed this episode, and am enjoying the changed up structure you’re pursuing at the moment. 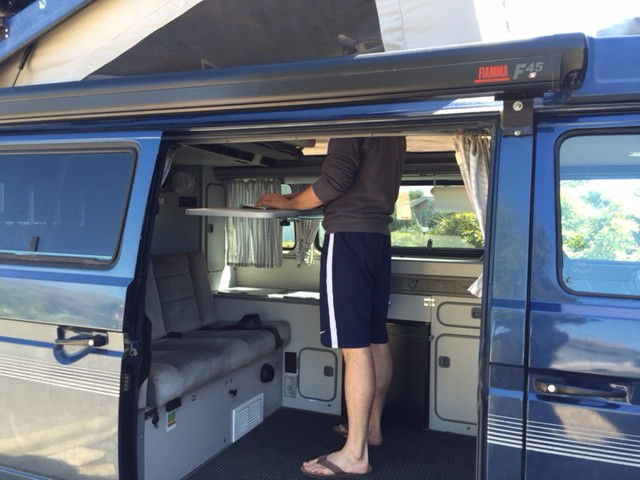 A mate of mine uses his camper trailer as a temporary office from time to time and loves it! Thanks for the great show and for the approach and good humour that naturally is part of your style. Thanks Garrick! Yeah, it actually surprised me how much I enjoyed working out of the van – loved it. 🙂 Appreciate you listening to the show! Just makes me want to get in the van and go with my two little rug rats. Great inspiration. Love the story. I have a crazy non business questions. I’m intrigued with the VW van. How do you like it? I have been looking for one… since this podcast made me aware of this cool camping device. What year is yours and how much do they usually cost? Would you recommend purchasing one. Any pro’s/Con’s you can share about the van.